A 2015 review showed that patients who experienced an average of 12 sessions of treatment recorded higher live birth rates than those who did no treatment or treatment only around the time of transfer. Based on this level of treatment, we believe the outlay for acupuncture amounts to tens of hours and thousands of dollars. The average cost of a visit to the acupuncturist will vary widely based on your geographic location and availability of acupuncture services. Your provider should provide you a clear and itemized cost estimate before treatment starts. Let’s look at how this may play out for an IVF patient who undergoes 10 treatments as well as 2 treatments on the day of embryo transfer. The patient may also be advised to add herbal preparations or other supplements to the treatment plan. The total costs come to $1,000 - $3,000. Unfortunately, there is not much patients can do to shave down their costs of care. Some of these approaches will help but few will dramatically lower your total costs. Ask your acupuncturist to provide a bundled discount for multiple treatments. Often it’s possible to get a discount of 5 - 15% off of the undiscounted rate. Purchase supplements online at lower costs. Check with your provider that you're buying from a reliable and trustworthy source. Acupuncture services may be covered by your insurance plan. Check with your insurer or benefits manager at work. If you are also being treated for pain, this is more likely to be covered and your acupuncturist should apply the proper code. Even if you are covered, there are are still a few more questions left. Is there a deductible? If so, have you already met the requirement, or will you have to pay “fee-for-service” until the deductible has been met? If your acupuncturist is out-of-network, what will the insurance cover? 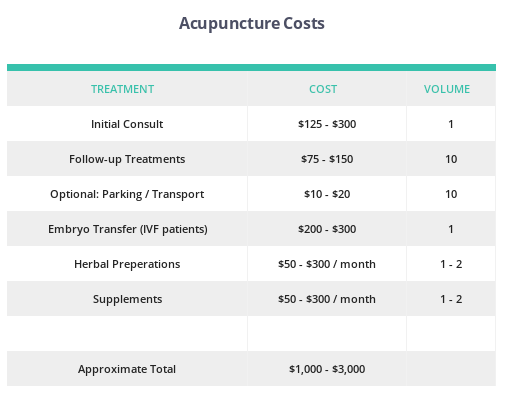 For context, an IVF treatment typically costs $20,000 or more, so a course of acupuncture at $1,000 - $3,000 might seem either minimal by comparison (or all the more difficult to manage). The money saved on acupuncture could be used towards additional treatment. For instance, it could pay for much of a frozen embryo transfer ($3,000) which may encourage single-embryo transfer and lower risks to the mother and child. Most IVF patients undergo 2 - 3 cycles, and if a patient forewent acupuncture for each cycle, they might save ~$5,000, which could pay the drug bill for one cycle or the costs of pre-implantation genetic screening. While an acupuncture appointment may only take 30 - 45 minutes, one must also factor in travel time, the time away from home or work and the potential stresses involved. Over a 10 session dose, this should equate to 5 - 15 hours of additional time invested. The stress of travel on the days of oocyte retrieval and embryo transfer may be acute. Below is a study that showed patients forced to travel for acupuncture on the days of retrieval or transfer had lower rates of success than those who did no acupuncture. As with any treatment, side effects during and after acupuncture do occur. With acupuncture, some patients will experience local discomfort, an aching sensation or bruising at the sites of needle placement. The aching or soreness from acupuncture typically lasts less than 24 hours. The risk are well under 0.1% of much more serious issues that would cause hospitalization or long term issues. Consider a longer duration of treatment and consider the financial ($1,000 or more) and time obligations (5 - 15 hours) involved. Weigh whether both financial and time considerations are likely to create more psychological burden than the benefits of acupuncture would confer. Alleviate cost burden by negotiating with your acupuncturist for package discounts and inquiring about whether you have insurance coverage. Consider having acupuncture treatment done onsite at your clinic on the day of retrieval or transfer. 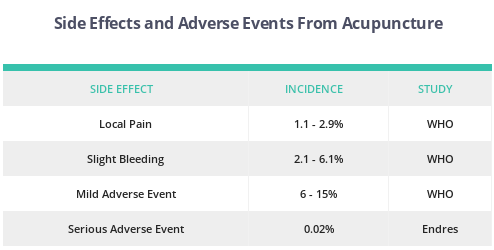 While major adverse events from acupuncture are exceptionally rare, patients with clotting conditions, atrial fibrillation and other issues should likely avoid it.